I had dinner at Stavro's Pizza House in Downtown Daytona Beach. 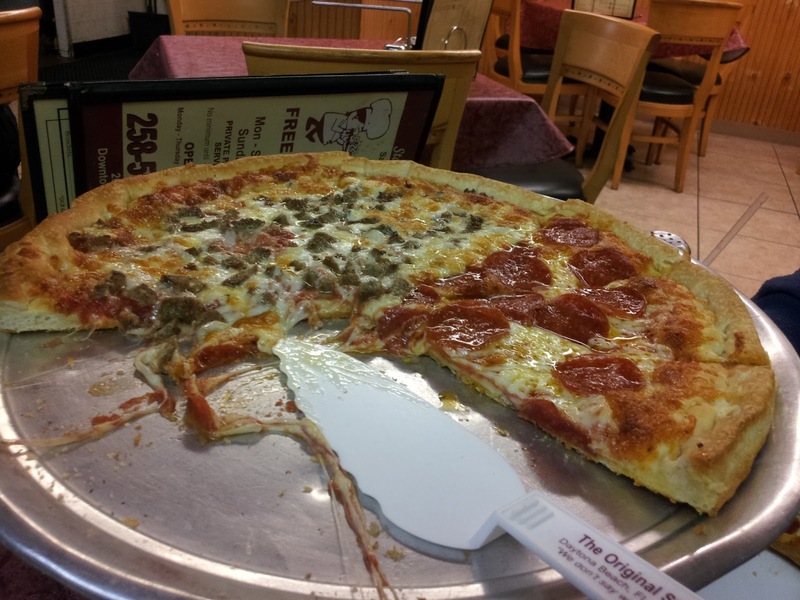 There seem to be lots of Italian restaurants in the area that use the Stavro's name. It's very confusing because they all claim to be completely independent and not connected to the other Stavro's in any way. The menus and foods at each of the Stavro's seem to vary a lot from location to location as well. I wonder what the story is here how so many Italian restaurants in the area all ended up with the same name? 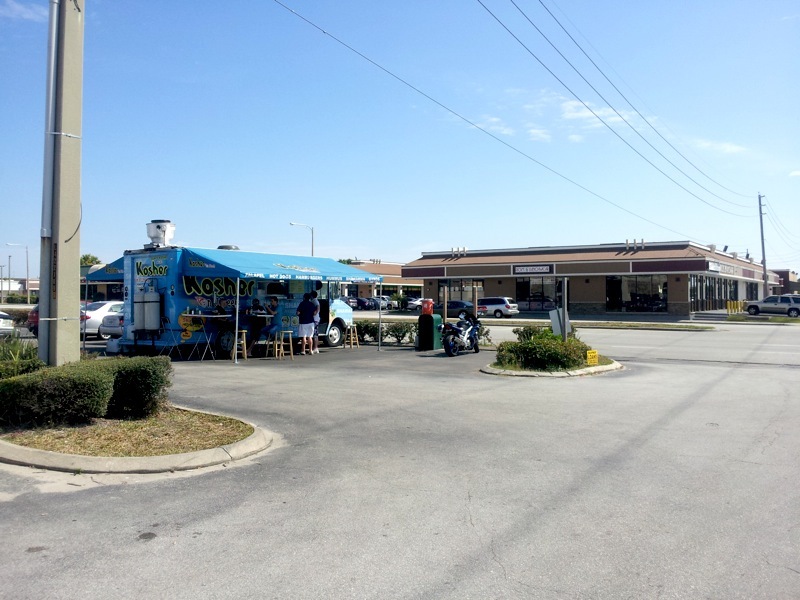 There is a food truck called Kosher on Wheels that is parked along International Drive near Fun Spot. 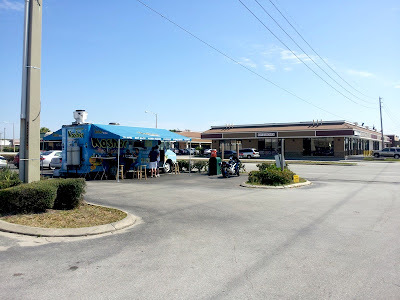 I was looking for something for lunch one afternoon and decided to give this truck a try. As far as food trucks at non-food truck events go, Kosher on Wheels seemed to be doing very good business. They had seating on both sides of the truck, and I got the very last open seat while I was eating. I got the feeling that about half the customers at the time were like me, there for some Middle Eastern food regardless of religious affiliation, and the other half was there specifically because the food was Kosher. I ordered a falafel pita. 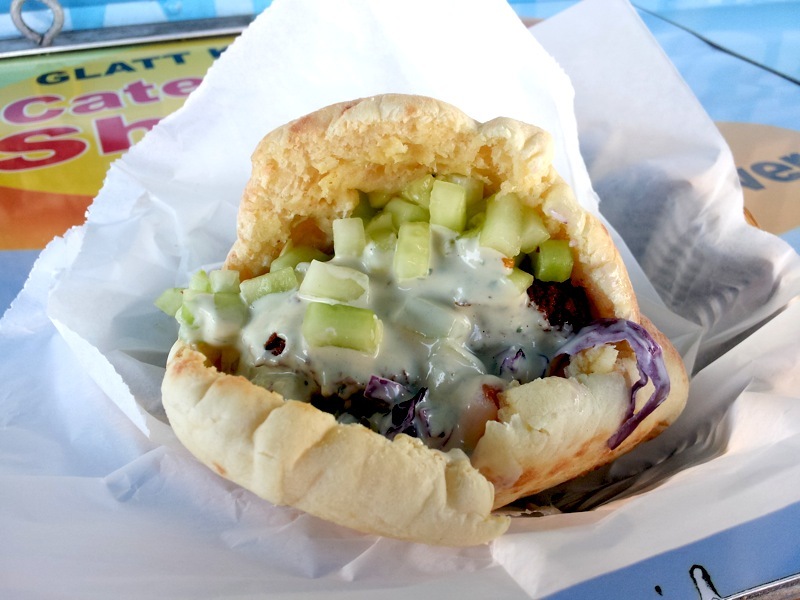 The pita was filled with a generous amount of falafel, hummus, tahina, red cabbage, onions, and Israeli salad (cucumbers & tomatoes). The falafel was very good with plenty of flavor and was nice and moist. There was also plenty of tahina, so much so that it started being absorbed by the bread. That is always a win in my book. At some point I want to return to this truck to try their shawarma. I enjoyed my falafel, so hopefully the rest of their food is just as good. I did think they were a bit expensive for the size of the pitas served, but they were pretty equivalent to many of the other 'gourmet' food trucks in Orlando. Everyone seems to love Wawa. 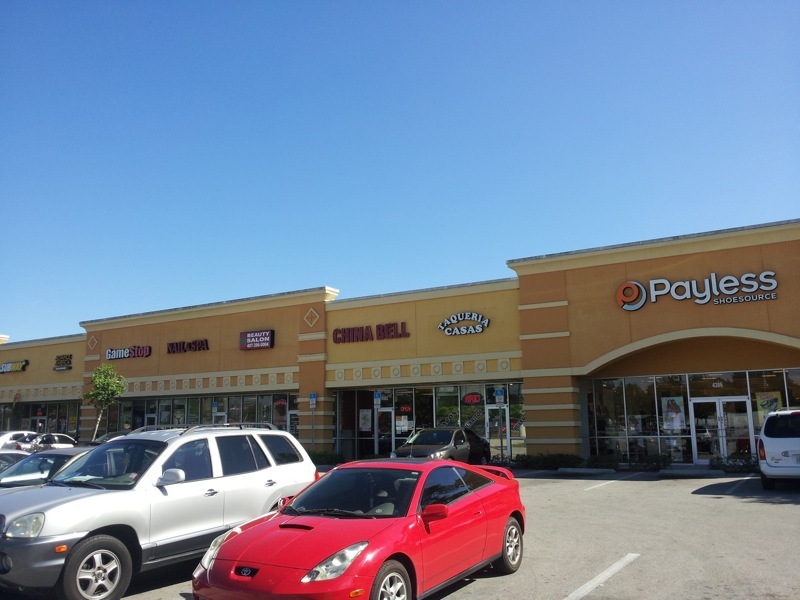 This gas station/convenience store chain recently expanded from the Northeastern United States to the Central Florida area. I've heard coffee drinkers rave about their coffee. People love their milkshakes. Above all else, I've heard people explain how wonderful their sandwiches are. 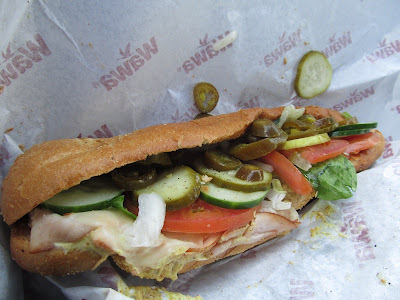 I recently stopped into the Wawa across the street from Sea World to finally give one of these amazing sandwiches a try. This Wawa had a large deli area. Orders are placed at several touch-screen computers set up throughout the area. While I do see the usefulness of this computerized ordering system, I just found it to prolong the ordering process and make it more confusing. Several orders could be placed at once using the computers and I'm sure they can keep track of inventory better, but it would have been much easier to directly order with the sandwich maker since the Wawa was empty at the time. Another thing that bothered me was the upcharge for wheat bread. Most other places don't charge extra for a sightlier healthier choice. 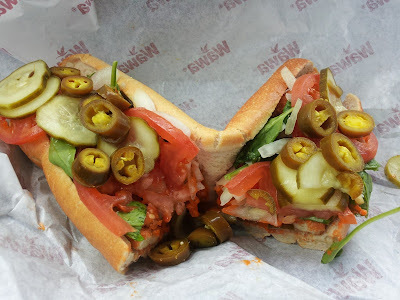 I ordered a turkey sandwich topped with spinach, tomato, cucumbers, onions, pickles, jalapenos, mayonnaise, and mustard on my first visit to Wawa. I actually returned to this same Wawa for a second time to try another sandwich. On this visit, I had a buffalo chicken sandwich. This consisted of fried chicken, topped with cheese, spinach, tomato, onions, pickles, and jalapenos. Whoever made this sandwich definitely went way overboard on the buffalo sauce. There was a large pool of sauce that dripped out of the sandwich by the time I finished. Otherwise, it was tasty enough. Everyone seems to love 4 Rivers Smokehouse. As much hype as the original location in Winter Park received, I didn't try 4 Rivers until they opened a location very close to where I live in Longwood. Since then, I've visited the restaurant several times and I do enjoy their food. I wouldn't necessarily say it's the hands down best barbecue around but they are pretty tasty with some interesting variations on the barbecue restaurant standards. 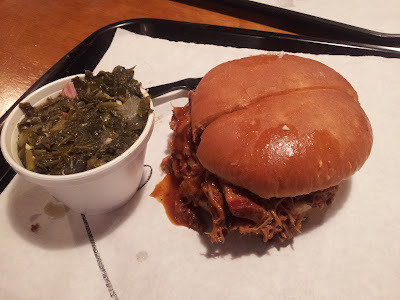 Pulled Pork Sandwich: This was pretty standard pulled pork sandwich. Shredded pork with barbecue sauce sandwiched between two halves of a bun. A very boring sandwich compared to some of the other stuff on 4 River's menu. 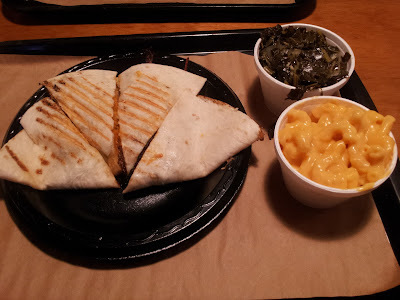 BBQ Quesadilla: I enjoyed this more than I thought I would. 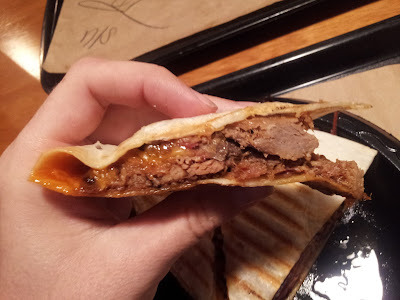 Pulled pork with melted cheese in a grilled tortilla. The smoked flavor of the meat and the barbecue sauce went really well with the cheese. Why does cheese rarely come on barbecue sandwiches? I liked it. 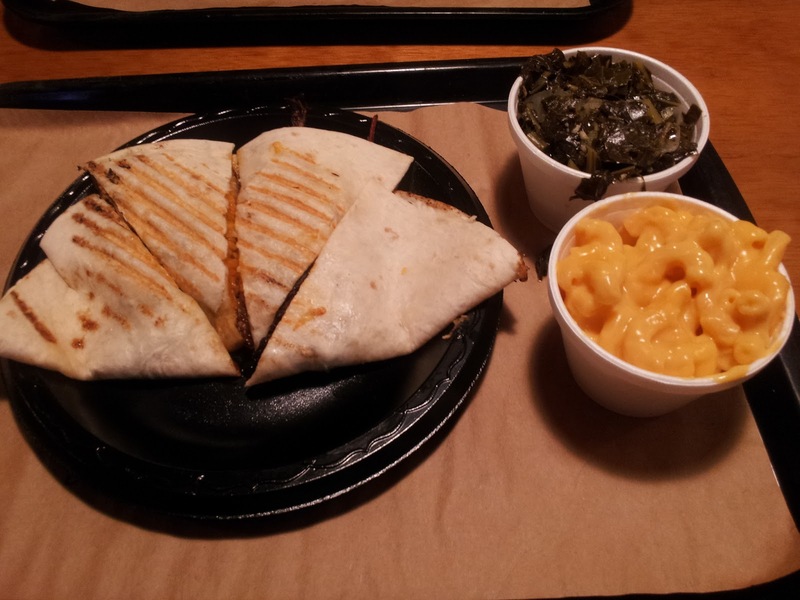 Had a side of collards and macaroni & cheese. 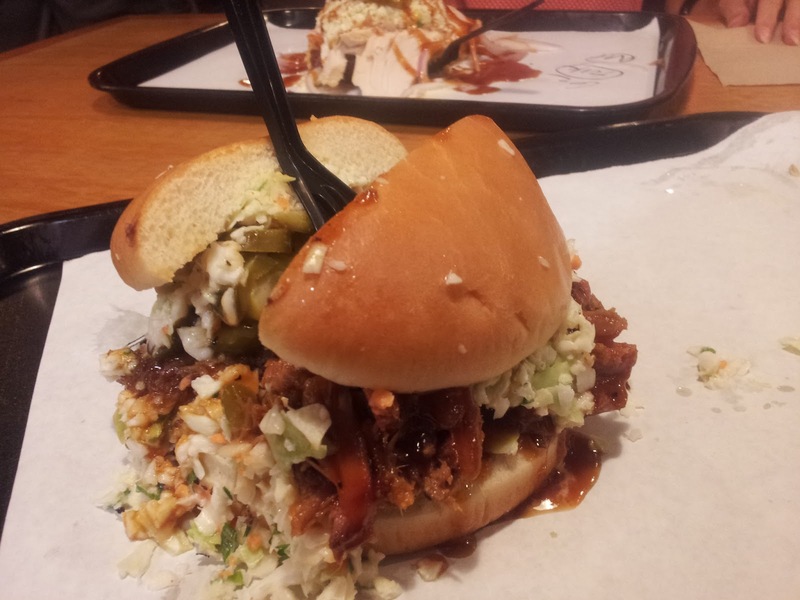 Messy Pig: Basically the same pulled pork sandwich as above, only with the addition of coleslaw and jalapenos. The additional toppings definitely add dimension to an otherwise boring pork sandwich. Six Shooter: This is one of the more interesting menu items that 4 Rivers has. 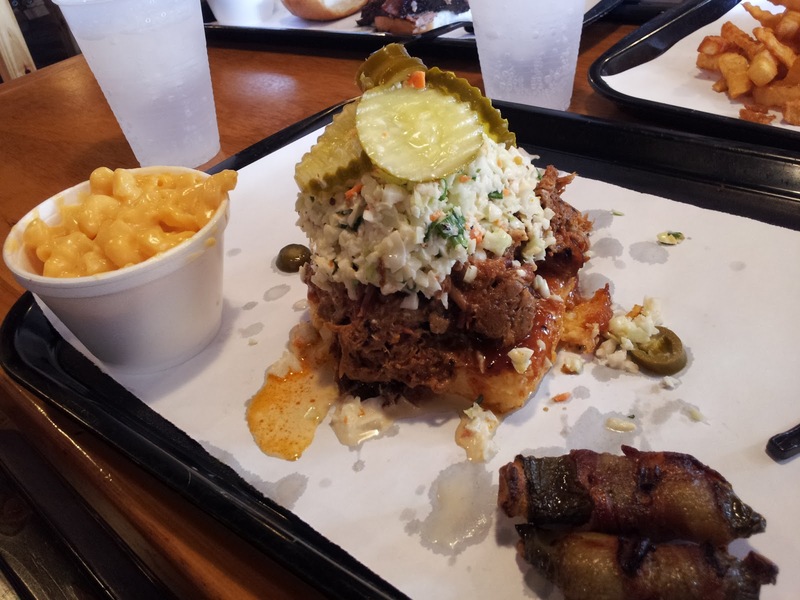 It consists of baked cheese grits topped with pulled pork, coleslaw, jalapenos, and pickles. Cheese grits topped with anything is normally good, and this is no exception. Also note the bacon-wrapped smoked jalapenos that I choose as a side. Seemed like they should have had potential but the peppers were too soggy for my liking. 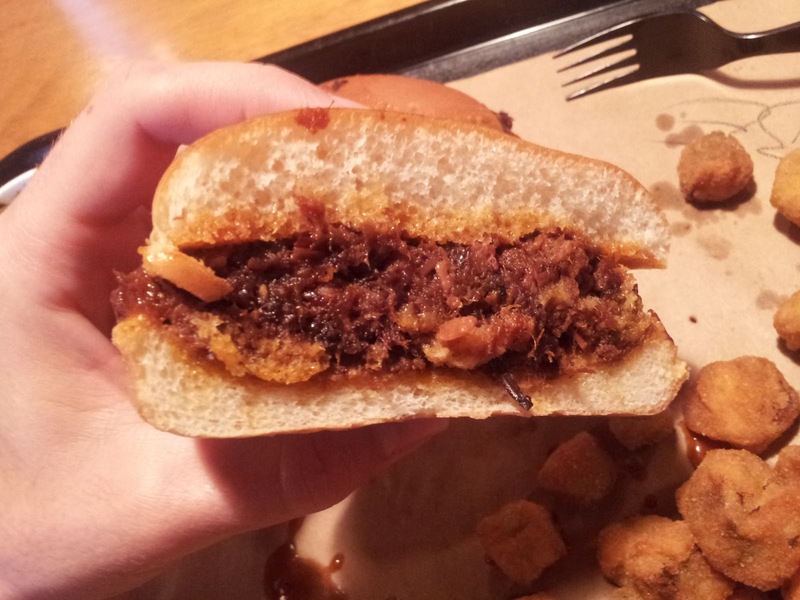 Burnt Ends: This sandwich was filled with 4 River's Burnt Ends which is a mixture of pork and brisket. Because the Burnt Ends were very saucy, much like the pulled pork, I didn't taste too much of a difference between the two sandwiches. The sauce was the dominant flavor on both so differences in the meat were somewhat buried. I was expecting to notice a bit more of a difference with the brisket in there, but I didn't. 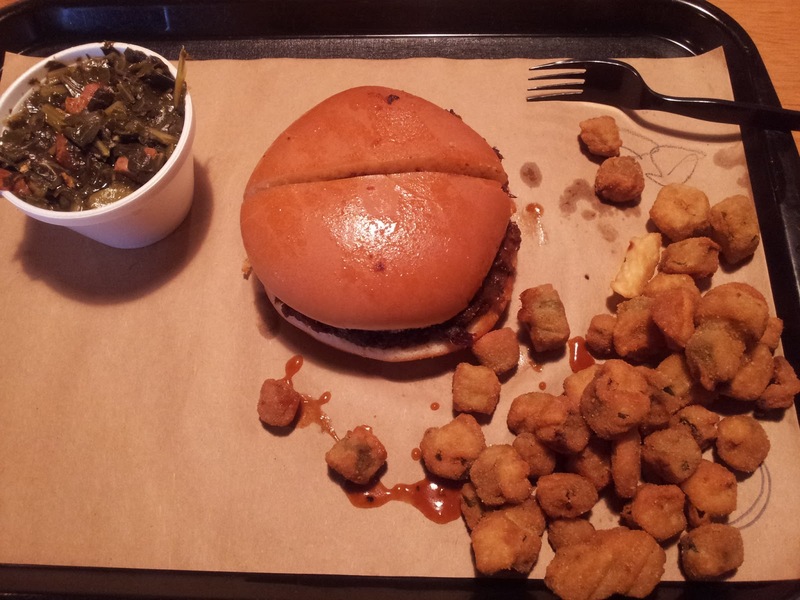 Fried okra and collards were my sides with this sandwich. The restaurant was pretty quiet when we first arrived, but about half-way through the meal, buses started to pull up and I found out where you are taken to eat if you're part of a Brazilian tour group. At that point, every table was filled with Portuguese speaking people. That is, with the exception of us and the Japanese tourist seated next to us (they were taking pictures of their food- my type of people). I liked the food. I'm not going to try and identify it all since I'm no expert on Brazilian food, but I'll do the best I can. On my trip to the buffet, I tried some soup, noodles, and a potato dish. My second plate included black beans and rice, beef, some sort of fish, and more of the potato dish from the previous plate. I was in Kissimmee and wanted to get a quick lunch. I ended up at a Chinese take-out in a strip mall along 192 called China Bell. I ordered one of their lunch combinations which came with shrimp with broccoli, fried rice, and an egg roll. 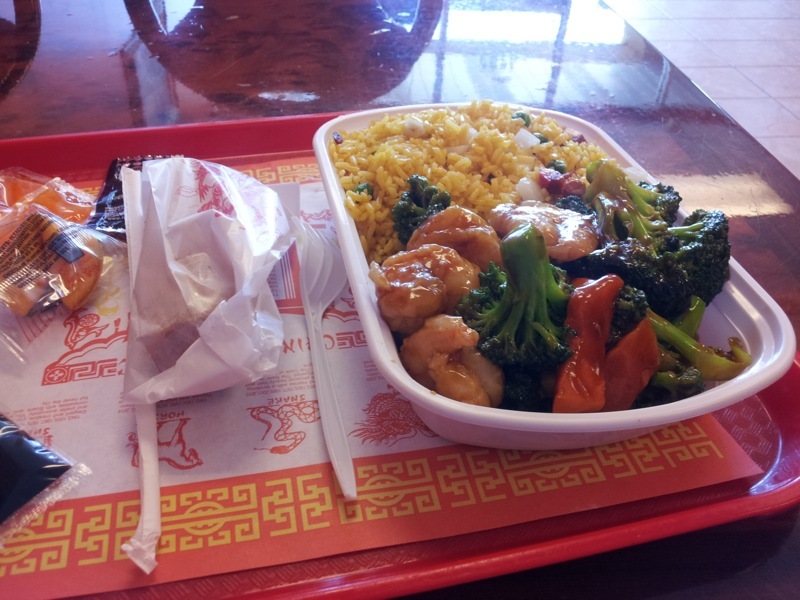 The shrimp were nice and large, served with lots of broccoli and carrots in a brown sauce. The rice was a little bland and needed to be spiced up with soy sauce. The egg roll was good, but pretty standard. Overall, this was a perfectly acceptable meal from a Chinese take-out. Very similar menu and food to most other take-out places. On the morning before I headed home from the Washington DC area, I visited a restaurant called Silver Diner in Greenbelt, Maryland after doing some hiking in the nearby Greenbelt National Park. I didn't realize it when I went into the restaurant, but Silver Diner is a chain based around the Virginia and Maryland area. They apparently attempt to use local ingredients in their foods. The sign on the table told me that they partner with 15 local farms. It's nice to see a semi-large chain doing stuff like this. I ordered the Local Farm Raised Bison Huevos Rancheros. This came with a chorizo and bison hash, over easy eggs, peppers, salsa, scallions, cilantro, goat cheese, chunky avocado and fried tortillas. This was very tasty (and the second time I've had bison on this trip), but it was almost too much meat. The huge mound of meaty hash definitely overshadowed the eggs and other toppings. I also would have preferred soft tortillas rather than crispy tortillas. Soft tortillas seem like they go a lot further than fried, chip-like tortillas. Another Washington DC restaurant. I ended up at a Mexican chain called California Tortilla for this meal. I ordered the Havana Chicken Burrito. As described by their menu, this was flame-grilled mesquite chicken, black beans, our spicy low-fat Havana sauce (with a touch of lime), Mexican rice, romaine lettuce, and fresh salsa. As far as fast food burritos go, this was tasty but nothing exceptional. I enjoyed the burrito but it was forgettable as to it wasn't anything I couldn't get at countless other burrito places. I ordered the combo, meaning the burrito came with tortilla chips and queso. While sightseeing in Washington DC, I stopped for lunch at the cafeteria in the National Museum of the American Indian. 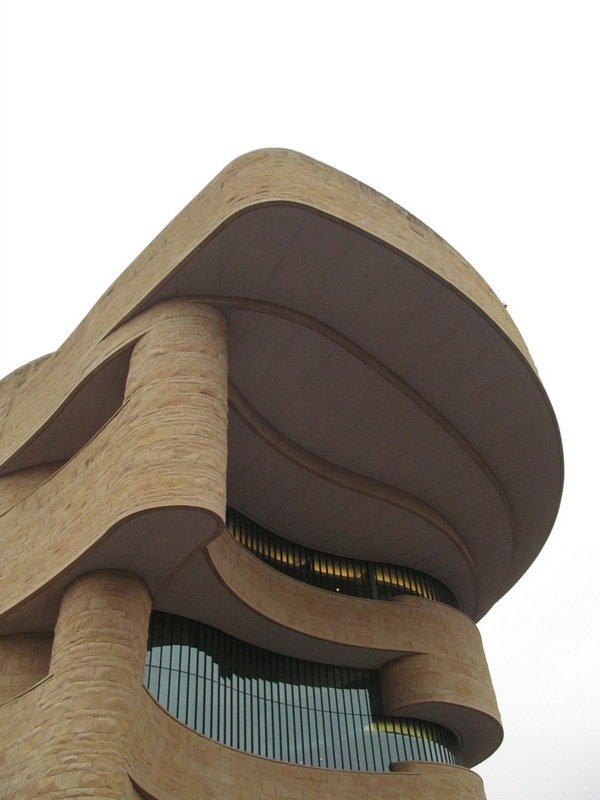 The restaurant is called Mitsitam Cafe and is set up with different stations, each serving traditional (I hope) Native American foods from different regions of the Americas. I ordered something that they called an Indian Taco from the booth serving foods from the Great Plains region. This consisted of a large, fluffy piece of fry bread topped with buffalo chili. Cheese was melted over the chili, and then was covered with lettuce and tomato. I really have no clue if this is something that is traditionally eaten by Native Americans in the Great Plains region, but it was pretty tasty. It couldn't actually be eaten like a taco since the chili completely covered the fry bread and silverware was used. The chili was slightly spicy with large chunks of bison floating around. The lettuce and tomato almost seemed like an afterthought how they were just thrown on top of the plate, but I ate it all and enjoyed my Indian Taco! 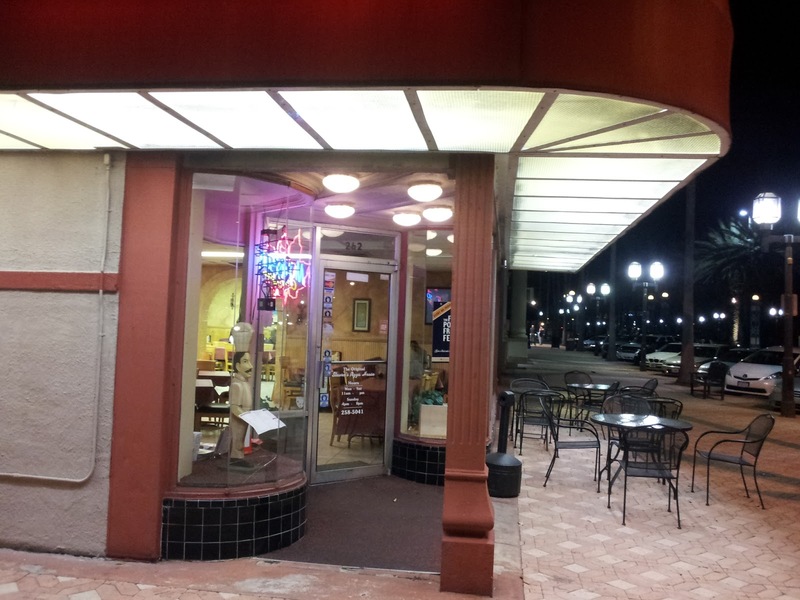 The Mitsitam Cafe was on the expensive side with my taco costing just over $12. Since it was inside a museum, I suppose it's equivalent to theme park prices so it really wasn't too bad for better food. Compared to the food options at the Air & Space Museum next door (McDonalds), this was definitely the better option as far as Smithsonian snack bars go!